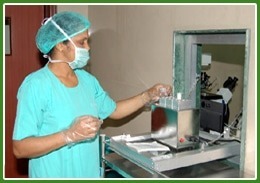 SCI IVF Hospital’s operating theatre is located next to the embryology laboratory. During egg collection oocytes are passed directly from the operating theatre to the embryology laboratory’s nurse-in-charge. Eggs are stored in tubes and are left to settle while sperm is prepared. Only one set of eggs and one sample of sperm are handled at any one time so there is no possibility that eggs or sperm intended for one client can be confused with eggs and sperm intended for another client.